Winter Garden Florida is about 14 miles west of Orlando on State Road 50 in western Orange County, Florida. Winter Garden's population is slightly more than 30,000. Winter Garden, Winter Park, Winter Haven and Winter Springs. I'll even mention Winter Beach over near Sebastian, but not many people remember it these days. The first settlers came to the Winter Garden Florida area just before the Civil War in the 1850's. They established small farms along the south shore of Lake Apopka. Winter Garden's economy depended largely on citrus and vegetable production. This economy was helped when the Orange Belt Railroad was completed and came through town. By 1900, a small commercial district had popped up along Plant Street and residential neighborhoods began to appear on the side streets. 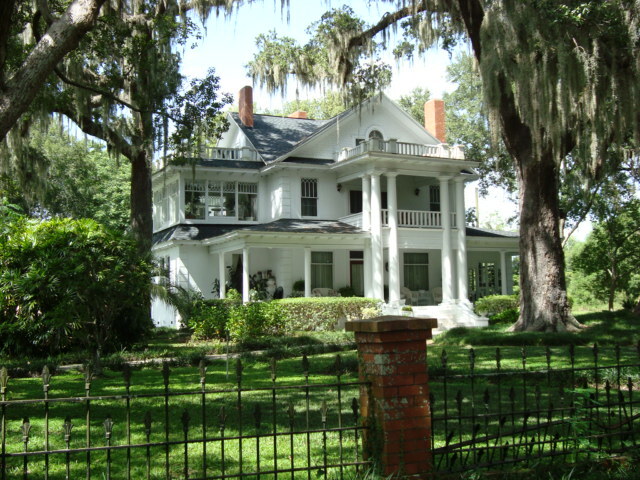 There are still many historic buildings in Winter Garden, most of them dating back to the period from 1915 to 1940. Many of the old railroad routes were combined into The West Orange Trail, a 22-mile long multi-use rail trail owned by Orange County. 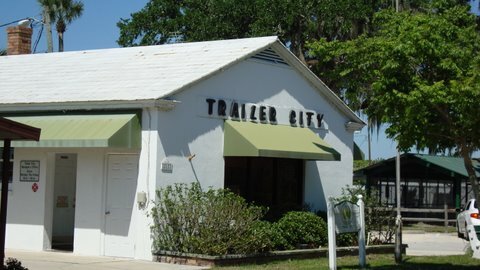 The trail passes through downtown Oakland, Winter Garden, and Apopka. It is very popular with walkers, joggers and bicyclists. At one time, especially in the 1930's, Winter Garden's location on Lake Apopka made it a fisherman's paradise. Lake Apopka is the second largest lake in Florida, trailing only Lake Okeechobee in size. Some of the best bass fishing in the United States was to be had in the clean waters of Lake Apopka. Winter Garden was the center of this fishing activity. Huge agricultural operations along the northern shores of Lake Apopka resulted in toxic runoff into the lake and its glory days as a fishing paradise are lost in the distant past. There are ongoing efforts to buy up the farms and improve the water quality of this beautiful lake. There has been some success with this effort, and we should all keep our fingers crossed. 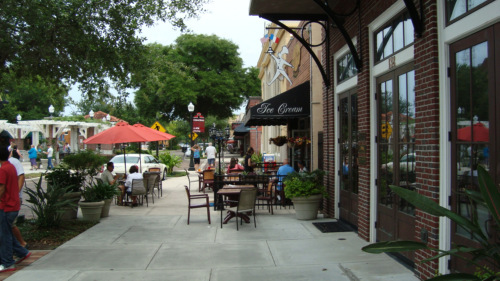 Historic downtown Winter Garden contains an eclectic collection of restaurants,shops, cafes, a train depot that is now a museum, and a theater. Brick paving, tree planters and benches make this a favorite spot for locals and tourists to visit. A few blocks north of downtown Plant Street are several public parks, a public swimming pool and community center. This area also has a large city owned trailer park called Trailer City that opened in 1936 and is home to a couple of hundred happy people. 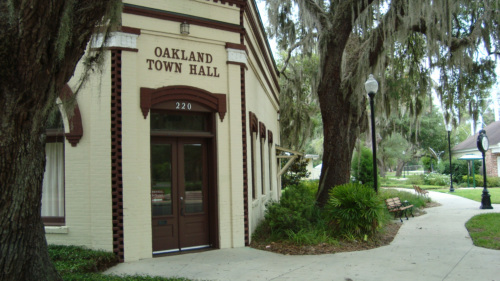 Oakland is a small town of about 2,500 people just west of Winter Garden Florida. It is also on the southern shore of Lake Apopka and a stop on the West Orange Trail. The town was once the center of this entire region of Central Florida. It was a railroad town, and many railroad people lived among the oak filled village streets. The town today is quiet and peaceful, and is a good example of the Old Florida so many of us miss. It's a short two mile drive from Winter Garden to Oakland. You will see some beautiful houses along the way. Oakland began to boom when the Orange Belt Railroad came through town in the 1880's. The biggest shareholder in that railroad was Peter Demens, who ended up running the railroad to St. Petersburg. He named St. Pete after his hometown in Russia. Oakland's economic fortunes began to decline when the railroads pulled out of town more than 100 years ago. The great freezes of 1894 and 1895 killed most of the citrus groves, and the railroads had nothing more to ship. The route of the original railroad is now the West Orange Trail, a favorite of walkers and hikers from everywhere. Then along came a fire in the late 1890's that destroyed most of the downtown. Some people don't miss the booming old days in Oakland and prefer the quiet serenity that now prevails. You will enjoy a visit to this quiet little Old Florida town. Ocoee is a small town on the east side of Winter Garden Florida. It was founded by Dr. J. D. Starke in the 1850's who brought his slaves into Central Florida and established a camp on the north shore of a lake that later became known as Lake Starke for obvious reasons. Starke and most of his group had contracted malaria, and were looking for a healthier environment when they came upon the lake. They got healthier and settled permanently in the area. The town was originally called Starke Lake, but changed its name later to Ocoee. The Florida Midland Railroad came to town in the 1880's, and the little village began to boom. After the American Civil War, a former confederate soldier named Captain Bluford Sims from Tennessee moved to the area and began planting citrus. Nobody is sure where the name of the town came from, but some have speculated it is named after an Ocoee in Tennessee. 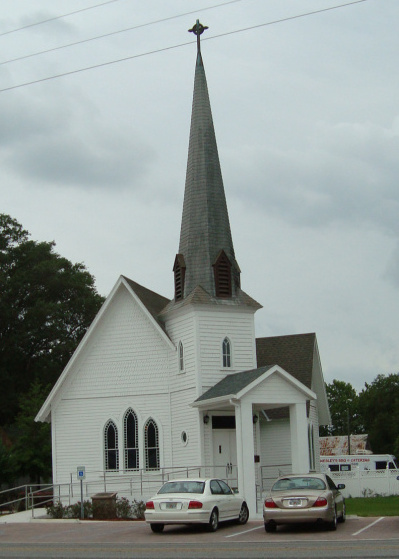 One of the still existing structures from the glory days of Ocoee is the Ocoee Christian Church, an example of Carpenter Gothic architecture at 15 South Bluford Avenue. It is on the U.S. National Register of Historic Places. It was built in 1891.